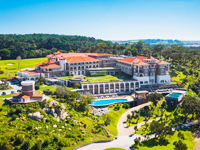 Penha Longa is an elegant palazzo-style estate situated among the rolling hills of the Sintra Cascais Nature Reserve. It features 2 championship golf courses and a state-of-the-art 1,500m² spa centre. All guest rooms feature private balconies, giving views across the landscaped gardens and golf courses. Beds are fitted with Egyptian cotton sheets, and all rooms are equipped with a Nespresso coffee machine, a high-speed internet connection and a plasma-screen TV. Penha Longa Hotel has 5 separate dining venues, presenting a diverse range of cuisines and dining spaces. LAB restaurant, innovative 22-guest gourmet restaurant, has been awarded its first Michelin star in November 2016. The hotel has many recreation facilities, including indoor and outdoor pools, both tennis and squash courts, and a fully-equipped spa. Penha Longa is in a prime location for making hiking and cycling excursions. 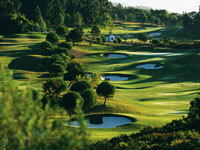 Penha Longa Resortl is located 35 km from Lisbon Airport. GPS: N 38°45'42" , W 9°23'49"